Keith Archers Tree Care Specialists are a leading professional arboricultural organisation. Based in London, we have been established since 1999, with offices in London, Kent and Essex. Our arborists are fully qualified and their skill and experience, along with high levels of health and safety, have earned us an excellent reputation for service. 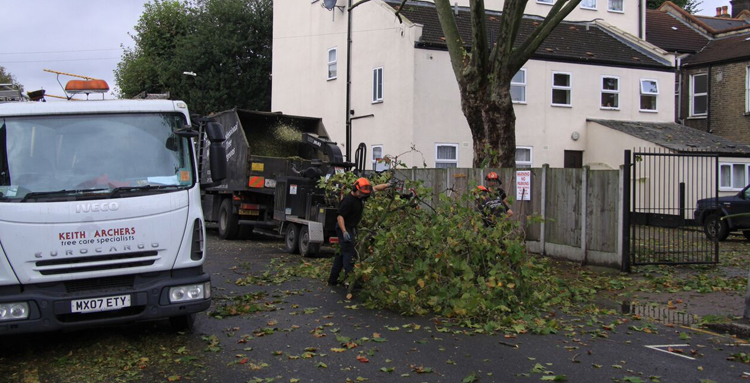 As one of the larger tree companies and with our extensive range of machinery our teams are able to cater to all needs, both domestic and commercial, from single tree removal to local authority tree and woodland management. We aim to continue to provide a dedicated service that caters to all our customers needs, whether large or small, on a professional and safe level and to improve our reputation as one of the leading tree specialists always continuing to exceed expectations. All of our work is carried out to British Standards 3998 Recommendations for tree work. with work carried out to British Standards 3998 Recommendations for tree work. Our teams are friendly and carry out work to a high standard with a wealth of knowledge and experience that other Arboricultural Contractors call upon with work they are unable to carry out. We are fully insured with £5 million public liability and can provide Risk Assessments and Method Statements. Always ask to see insurance. Our offices in both Essex and London are within easy reach of the M25 so we cover all of London and the Southeast. When you're looking for a tree surgeon in London look no further than Keith Archers Tree Care Specialists. Call us today for further information or to discuss your requirements with our friendly, helpful team.